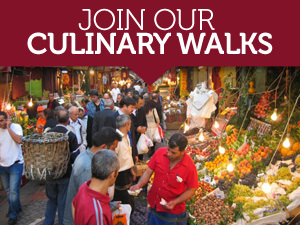 Despite the surroundings, working as a candyman in Istanbul is apparently not all sweetness. Take, for example, Mustafa Bey, who inherited the 132-year-old traditional Turkish candy shop, Merkez Şekercisi, from his grandfather. On one recent afternoon, he grudgingly answered a few questions as if we were neighborhood ragamuffins begging him for a free piece of lokum. Without looking up from the sports page he answered, “Well, I’m 56 years old, so I guess I’ve been working here for 56 years.” Mustafa has always been here. End of discussion. 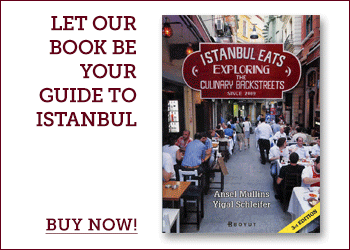 Luckily, there are sweeter things to behold in the historic Balat neighborhood’s Merkez Şekercisi than Mustafa Bey. The house-made lokum dusted in sugar, the ekmek kadayıf and the wide tray of baklava in the front window had us captivated. While Mustafa weighed out a generous slab of the ekmek kadayıf, we sat at the one and only table and enjoyed the pleasant time warp provided by the shop’s vintage scene – the mint green hue of the room (a jarring reminder of previous generation’s tastes), Formica counters on which a large enameled scale sat (perhaps it was Mustafa, in his own mischievous youth, who slapped a Beşiktaş soccer sticker on the grand old Wartburg candy scale? ), and a jalopy of a cooler in the corner that chugged and hummed. 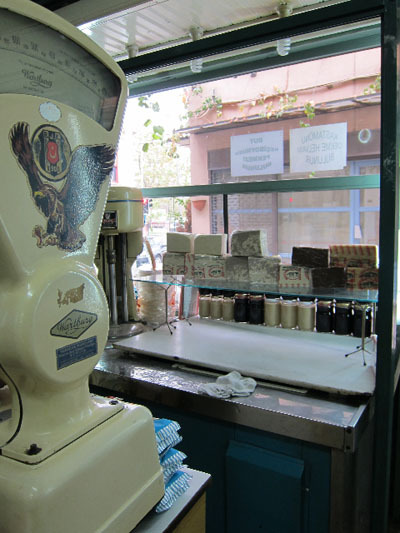 If the décor was left over from Mustafa’s grandfather’s days behind the counter, the ekmek kadayıf was absolutely of the moment. Two slices of syrup-soaked bubbly shortcakes sandwiching a schmear of bright white kaymak – this can be a gooey mess within hours of preparation. The one at Merkez was pleasantly saturated but firm, the kaymak a comparatively crisp note between the saccharine decks of ekmek kadayıf. 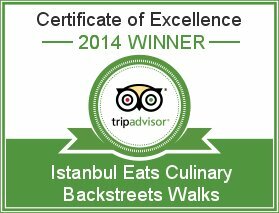 We left Merkez Şekercisi with a small bag of the shop’s güllü lokum, eating it as we followed the narrow streets through the Balat market. Perfumed gum drops – in most cases, an offering we’d politely decline. But standing outside of Merkez and thinking about Mustafa’s grandfather and the Ottoman period he lived in opened up new dimensions in our sweet tooth. Later, as we walked past supermarkets and corner stores stuffed with Gofret bars, Cadbury’s and Ülker’s latest creations, we started to understand Mustafa’s gloom. He’s probably the last guy on the block who still remembers the heyday of güllü lokum. Wow. This was way sadder than an article about a candy store should be. Aww this is such a bittersweet story..its kinda sad those global brands are eating up the market pretty much any developed/developing places in the world, but I believe people will come back soon to the traditional, artisan, local confectioners. Hershey and Nestle already changed the recipe of some of their items (Mr. Goodbar, Krackel, Crunch to name a few). I thought it was my tastebud changing and me becoming a candy snob, but it was them changing the formula. It tastes like crap and I can’t stand it. I hope that the small stores you introduce here last a long time, until I visit Turkey. Personally I am very intrigued by the “perfumed” gum drop because I am attracted to almost all dessert items with floral touch. I think the traditional candies look beautiful as well.